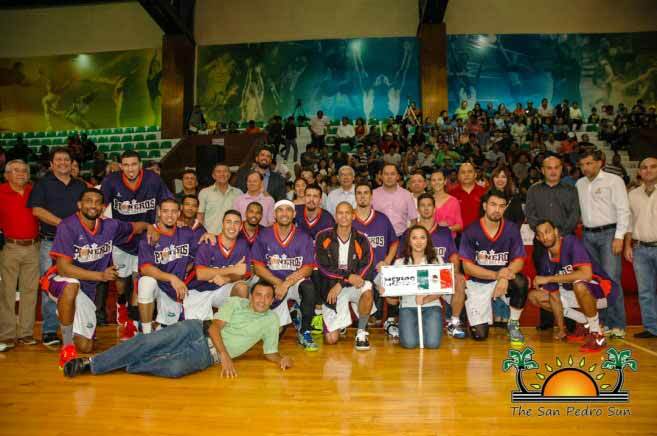 One of Mexico’s top basketball teams, Pioneros of Cancun Quintana Roo, wiped the court with Belize’s San Pedro Tiger Sharks in a friendly game on Sunday November 30th. The much anticipated match took place at the Erick Paolo Martínez Sporting Center in Chetumal City, Mexico. The game was organized through the Belize-Mexico Partnership Committee as part of the cultural and sporting exchange program between the two countries. The 2014 National Elite Basketball League, San Pedro Tiger Sharks took its original team, along with two new members as reinforcement to represent Belize. On the other side, Pioneros of Cancun, one of Mexico’s top teams, brought in four team players for the Mexican national selection who played in the World Cup of Basketball in September.